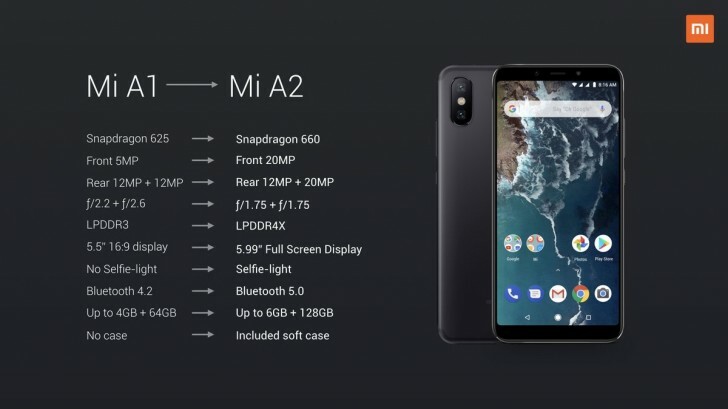 Xiaomi just unleashed its Mi A2 Android One-powered smartphone to the global public with a heap of improvements over its predecessor. So to sum up the improvements on the new device, Xiaomi has created a neat little side by side of every one. Our picks as biggest are the chipset - Snapdragon 660 over SD625, the optional 6GB/128GB model, the selfie camera - 20MP over 5MP and the taller display. The Xiaomi Mi A2 will come to 40 markets. The earliest to get it is France on July 27. Italy and Spain will get the Mi A2 on August 8 and August 10, respectively. The price in Spain starts at €250 for the 4GB/32GB, €280 for the more sensible 4GB/64GB and tops out at €350 for the pick of the bunch 6GB/128GB model. That last comparison of back cover case shows how much Xiomi is trying to justify for the increased price of MI A2 with cons of not having 3.5 jack and sd card support. They do fear that their Note 5 pro is still a better over all option in India.